The West Hill - Highland Creek Lions once more participated in Heron Park's annual Breakfast with Santa, helping out in the breakfast and gift distibution. In addtion the Lions arranged for a visit by Santa and printed free photos with Santa for all the children. Our popular Holiday Craft & Gift Sale once again sold all the table spaces available for vendors. New advertising signs also attracted more visitors to the sale as attendance seemed noticeably higher than in recent years. In addition to the sale of tables to vendors, we raised money by selling hot apple cider. The Country Style concession also donated 100 tickets for hot dogs & a pop, which we were able to sell to the public. Finally, our 50/50 draw was more popular than ever, with winner Gord Graham taking home $200. The West Hill - Highland Creek Lions once again celebrated their charter anniversary (their 67th) with a fundraising lunch/theatre event at the in Whitby. While ticket sales were lower than in previous years, the Theatre's special program for fundraising still allowed the Lions to raise about $1,200 for community projects. Thorn, Cynthia Millicent - June 9, 1935 - November 6, 2011. It is with great sorrow that the family of Cynthia Millicent Thorn (nee Morgan) announce her passing on Sunday, November 6, 2011 in Toronto at Sunnybrook Hospital. Cynthia is fondly remembered by her husband Dennis; daughter Andrea Fatona; grandson Otis Fatona-Pinet; brother Holmer Morgan and his wife Yvonne. Also survived by cousin Una Red and Clarence; niece Sandra Crawford and nephews Holmer Jr. and Edgar. She will always be remebered by Ena Morris and family. Family and friends are invited to visit at McDougall and Brown Funeral Home, 2900 Kingston Road (East of St. Clair) on Friday, November 18 from 2-4 and 6-8p.m.. A celebration of Cynthia's life will take plast on Saturday, November 19 at 11 a.m. in St. Margaret in the Pines Anglican Church, 4130 Lawrence Avenue East, Scarborough. A heartfelt thank you to the wonderful staff at Sunnybrook Pallative Care Unit for the care and support. Cynthia was a long-time member of the West Hill - Highland Creek Lions Club. The club will be attending the celebration of her life on Saturday. The West Hill - Highland Creek Lions became a major sponsor of the Yummy Tummy's Breakfast Club today with their presentation of a $2,000 cheque to help fund breakfasts for children. The Yummy Tummy's Breakfast Club operates in conjunction with the East Scarborough Storefront and provides breakfasts for large numbers of children during the school year. The Lions Club had previously donated a fridge to the breakfast club. MacQUARRIE, Margery (nee Haffenden) - Passed away peacefully at the age of 87 at Southlake Regional Health Centre on Thursday October 6, 2011. Dearly loved wife of Ray for 52 years. Cherished mother of Andy and wife Laura. Loving Nanny to Mathew, Lindsey, Victoria, Tina and Rachyl. Great-Nanny to Emma. She is survived by her brother Ron and wife Rose. She was pre-deceased by her sister Nora and her husband Bert. Visitation will take place on Thursday October 13, 2011 from 11am-1pm at The Simple Alternative Funeral Centre, 1057 Brock Road, Pickering. Service to follow in the chapel at 1pm. Interment at Resthaven Memorial Gardens 2700 Kingston Road Scarborough. Long-time West Hill - Highland Creek Lions member Margery (Midge) Joan MacQuarrie was one of the first female Lions Club members in Canada. Midge is seen here with her husband Ray, who was a member of this club for over 40 years, at their 50th Anniversary party on February 7, 2009. The West Hill - Highland Creek Lions were again active at the West Rouge Family Day, supervising the mini-circuit electric vehicle rides and running a 50/50 draw to raise money for the Dog Guides of Canada. Once again the West Hill - Highland Creek Lions were active at the Heron Park Family Day, giving out more than 600 snocones to the visitors. The Lions would like to thank the Optimist Club of Rouge Valley for providing the machine and some of the supplies needed to make the snocones. The Lions would also like to thank Bruce and Betty Smith for providing ice. The West Hill - Highland Creek Lions once again provided the children's play area at the Highland Creek Heritage Day festival. In addition to the popular Mini-Circuit electric vehicle rides and a bounce castle, there were bowling and other games, free popcorn and candy floss, and entertainment courstesy of a local children's dance group. The Lions would like to thank the Optimist Club of Rouge Valley for providing the equipment and supplies to make the popcorn and candy floss. 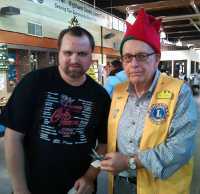 The Lions also held a 50/50 draw which raised about $50 for the Dog Guides of Canada. In addition to volunteering at the Port Union Waterfront Festival, this year the West Hill - Highland Creek Lions also took on managing the Port Union Waterfront Run. Over 150 runners and walkers took part in this event which raised almost $2,000 for Lions projects in this community. The West Hill - Highland Creek Lions Club held its annual spaghetti dinner at the Heron Park Community & Recreation Centre for a capacity crowd. In addition to home-cooked spaghetti, the guests heard guest speaker John David Stewart (MD HonBSc DECH CCFP MACOEM Managing Consultant Research SHS SynergyHealthSystems Senior Fellow Mayo Alumni Fellow Senior College, University of Toronto) give an interesting talk on vitamins and aging. The Club took the opportunity to present certificates of appreciation to the Port Union Seniors Memory Band, Ellis Flowers and Pristine Property Management for their support to Lions projects. The West Hill - Highland Creek Lions worked with City staff and the Tam Heather Curling Club to organize a very popular Little Rocks curling event at the Port Union Winterfest. Several members of the Lions Club were guests of the Yummy Tummy's Breakfast Club to witness first hand the benefits achieved by their recent donation of a new fridge to the club. The breakfast was indeed yummy and helped filled our tummies.